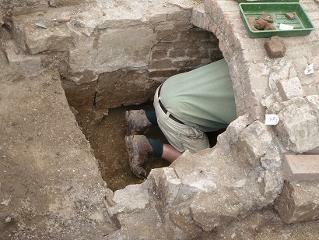 Welcome to the second part of the Webmaster’s diary as the dig comes to the end of its first full week. With all the news focussing on the trenches and the discoveries, I thought it’s about time we met some of the people involved. Last year after keeping everyone’s spirit’s up in Trench 9, this year, Diane Smith has spent much of her time above ground, organising and motivating the finds processing people. The result is that we are well on top of our finds, have a good working strategy for dealing with and recording them, and the whole process is in capable hands. Finds processing isn’t the most glamorous of tasks, especially with underground video-cams roving about, but it’s a vital part of the excavation and interpretation process. Well done to Diane and all the “pot-washers”. The Middle Weekend of the excavation was our traditional and highly popular “Open Days” when the interested public could come in, look at some of our star finds this year, and take away some of our “surplus” material to cogitate what Archaeology is all about. As usual Sunday was the most popular day with interest being shown from mid-morning through to the scheduled closure. 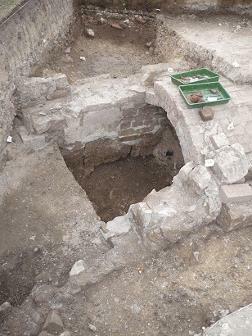 The exciting discovery of the end of the early culvert in Trench 13 is tempered by the need, now, to understand how the “water feature” had actually been fed, what the meeting of culvert and lake were like. We now move into a phase of recording and planning (drawing) the features prior to making the next move. This is important for WARG, because it is the recorded, written and drawn (and measured, weighed and orientated) record which is what the excavation passes on to the future. A record useful to WARG members, local historians and the local Winchester Museum archive. Below we can see the end of the early culvert and some of the stone-work on either side of it — this needs to be examined and clarified over the next few days to get a picture of what the edge of the water feature may have looked like. 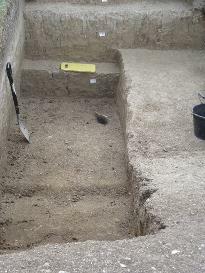 In Trench 19, the walls to the byre/outhouse/abattoir (right) have been cleaned up and the temptation will be to extend the trench along one of the walls to try and establish, in the time available, to what extent this area was used and for which of those purposes. The decision for that currently (Sunday) rests with your esteemed diarist. 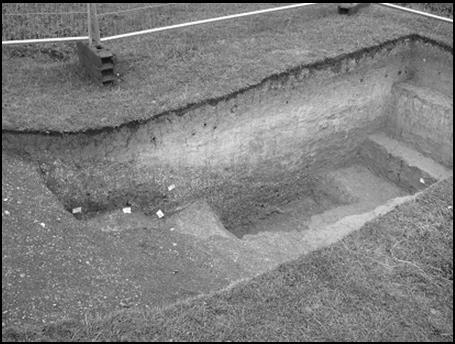 What is interesting about this feature is the area to the south of the “water feature”, which appears to be bounded by the various ditches (including Trench 17) and banks forming an “enclosure”. Was this an area of more intense farming activity as well as water management? Frustratingly, much potential dating evidence is sitting in finds trays, waiting to be washed and classified - which is right and proper, because the story will unfold eventually, not overnight…. ….and sleeping soundly overnight will be Don (birthday boy leaving the site early to celebrate) and his crew who continue to delve the ever-deepening depths of Trench 17 looking for evidence of its Saxon origin. 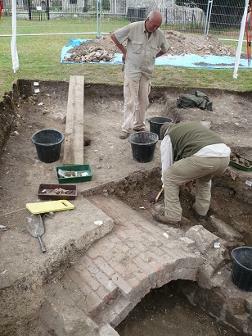 Finally, today, at last, a piece of pottery pops up which may start to shed light on the dating of this feature (left). The problem is, as the usual point/counterpoint is made over the three-thirty cuppa: is the rough pottery sherd of Iron Age, Saxon, or later Mediaeval date. 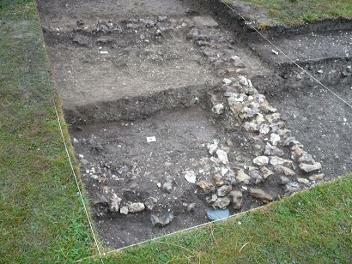 Tuesday 10th August was the day the heavens decided to open on our dig. The only trench badly affected by this was 17 which, due the clayey and cloyey nature of the silty contexts would have been pretty unworkable - as it happens, trench-master Don Haynes put his back out on Monday so both the trench and its digger were out of action - without the bottom of the trench being found. The section looks good, though. Garrard & Dave’s trench 16 was closed down today after recording and planning. In a strategy change this year, trenches will be closed down when they are completed - to avoid a backfill rush at the end. We have a second test trench, 14, which was begun right in the middle of the “water feature” and so far appears to have come up with very silty, possibly natural, riverine layers. 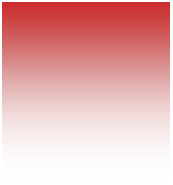 One metre square this one and an exercise in sieving. The culvert trench has been cleaned up nicely, and good view can be seen up the old Lockburn culvert (the one superseded by the current Lockburn drain). 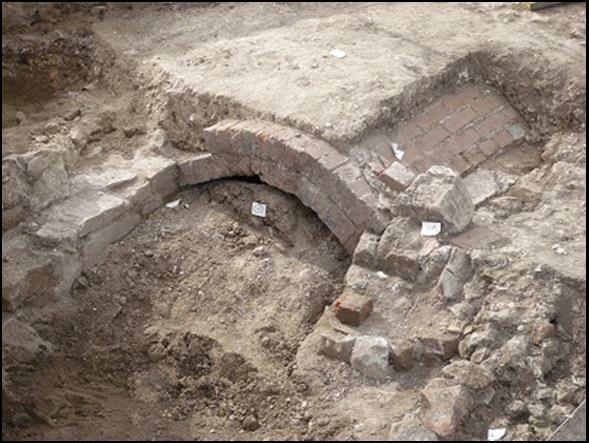 This is lined with dressed greensand blocks (perhaps the early course) which appears to have been covered with a brick arch later. 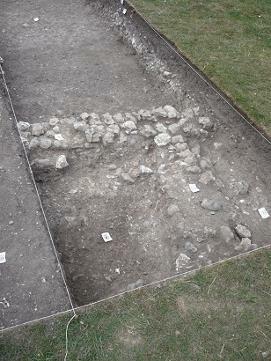 Trench 19 has been extended to the west to try and give a better idea of the buildings represented by the newly discovered walls. A couple of hours’ mattocking produced an extended wall with a return - and a nice corner stone, obviously reused from some earlier buildings on the St. Cross Estate. 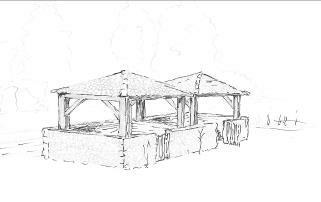 The finding of a coin on the inside of the western-most “room” could well give us the all-important date that these supposed outhouses or abattoir were constructed or in use. Mid-Week 2 and the dig organisers are already planning for recording and closing down trenches as their objectives are met and all the paperwork is completed. This is a deliberate timing designed to ensure we are off-site (once we have had the BBQ) with the least backlog and the most knowledge. As the turf goes back on Trench 16, the story of the “lost” culvert in Trench 13 is elaborated, as we exercise some ingenuity to view its interior. 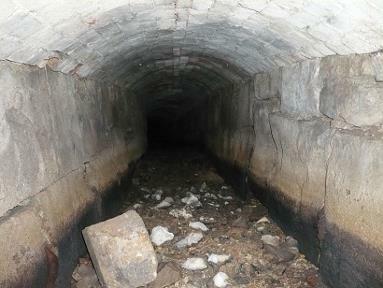 Initial low-level sorties by Techer (below) develop into long-range reconnaissance as the nature of the blockage of this culvert (when the current culvert of the Lockburn was realigned) is examined. How the water flow of the original culvert was diverted into the moat/water feature becomes clear from the alignment of dressed greensand, which seems to be just one period of many realignments, reworking and repointings as the culvert was maintained. Much speculation ensued today, especially as the culvert appears to run uphill at one point (though probably due to a false gradient due to silting). This has to be said is the most spectacular trench, vertically and contextually, as layer upon layer tells the story of the drainage system of the Hospital, and provides ample scope for interpretation and argument. Finally in this “Diary”, let’s consider another bunch of people without whom the dig would have been bereft of an important facet, the young people, some of whom were just about to start University, were considering options or were researching post-graduation (including Dave from Oxford University, researching oyster-shell diagnostics). 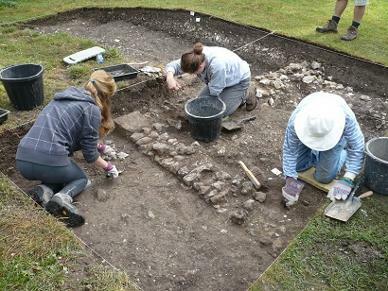 It’s great to see so many keen youngsters, and to name just a few (because I’ve lost count) there’s Russell, Stuart, Eva and Jenni (right, busy cleaning the walls in Trench 19), and Gareth - all of whom have played their parts in enlightening a little bit of history.